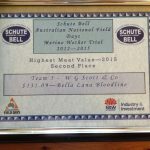 Scott Brien, on behalf of Tim Scott, Molong, received The Schute Bell Australian National Field Days Merino Wether Trial 2012 – 2015 Award for second place in the Highest Meat Value-2015. 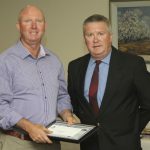 The award is presented by Brett Douglas in Orange. Bella Lana Bloodline also received 2nd heaviest carcass in all 3 years (2013 / 2014 / 2015) and 8th place highest average fleece in dollars. There were 29 teams involved in the trial.